After the flurry of activity on my blog in December for the Advent Calendars you may have wondered why I disappeared… well the reason was I took a vacation to Australia right after Christmas! I spent an hour or two photographing everything in the Lake Michigan ballroom, and afterward was feeling really tired, achy, and hungry. So I set my computer to the task of uploading all those photos, and headed out for dinner. After dinner I stopped at Walgreen’s for a few snacks and beverages, and walked back to the hotel. The roads around here are really bad when it comes to sidewalks. Milwaukee Ave has sidewalks on both sides up until about 50 feet from the intersection where I needed to cross for the hotel. I had to walk on the grass (which was luckily dry) to get to the intersection, then after crossing at the crosswalk (at least they had that) I had to walk on the grass again as there was no sidewalk leading up to the hotel entrance (though with a slight detour I could have walked across the parking lot). In California, there would have been more complete sidewalkage, I am sure. When I got back to my computer it had finished uploading all the photos so I spent some time fixing the ones that were rotated 90 degrees one way or the other. I left my computer and most of my stuff in the hotel room and went to tackle the Ravinia ballroom. I stayed up late Friday night until around 2am taking pictures in Ravinia, and still didn’t finish. I got up in the morning in time to finish taking pictures there, which I did, but not before I ran into some technological issues. Late at night when I was trying to dump my camera I ran out of disk space. So Saturday morning I was talking to one of the guys from the local train club and he offered to take me to Wal-Mart. I bought a 1TB small hard disk and a large cheap suitcase for all the LEGO sets I had bought. I copied all my files to the new disk, but it’s really slow. I’m not sure why but it seems USB activity on my computer is significantly affected by its presence (I think it’s not capable of talking USB to two devices at once, and my laptop’s memory card reader slot counts as USB). Every time I take a picture it saves both a 10 megapixel JPG file and a RAW file – the latter being several times larger than its corresponding JPG, containing the original data captured by the camera for post processing purposes. I’m considering turning off the RAW feature when I take pictures at events like this but it still seems like a good idea in case I ever need to go back and reprocess a picture. Anyway, once the crowds came pouring in, I spent a lot of time in the hotel room, where I managed to get all the LEGO sets I’d bought into the suitcase – by removing them from their boxes and putting them into extra plastic bags that I’d got from the LEGO store. I did go down and take some pictures though, to show what it’s like full of people. Once the crowds left I went over to the next ballroom, Botanic Garden, and took pictures of the models there. One large display in the center of the room was being torn down while I was there – someone had received news that a family member was in the hospital, and he had to go right away. One other thing that won’t come through in the photos is the Christmas music that was constantly coming out of one holiday-themed display. The owner of the display was nowhere to be found, but the music was pretty pervasive throughout the room. Christmas music, especially highly religious songs, should not be played in a secular public event in June, full stop. While I was taking pictures in that room, the announcement came over the PA for all attendees to gather in front of the hotel for a group photo by Joe Meno, editor of BrickJournal. We stood on and in front of the fountain by the hotel entrance and smiled on the count of 3, then I went back inside to take more pictures in Botanic Garden, and back to my room to download them onto my computer and hard drive. Saturday night at 10pm, one of the best things about Brickworld happened – the World of Lights and Sound. The “World of Lights” was started two years ago, when I came to Brickworld for the first time in 2009, and now they’ve added sound to it. 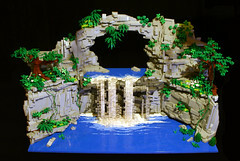 It’s promoted by LifeLites, a company that produces white LED lamps for use in LEGO models. Lots of people added the lights to their creations and when 10pm on Saturday rolled around, the room lights were turned off, leaving the models to shine for all to appreciate. Most of the models were unlit, but those that were did some pretty amazing things. Some people used black light, which causes transparent LEGO parts (especially the transparent greenish yellow color) to glow. Many of the town buildings were lit, and a few of the vehicles (such as trains) had interior lighting and/or running lights. 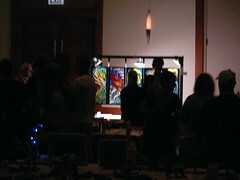 There were some mosaics built out of transparent colored parts (like stained glass) that were backlit to good effect. There was a contest, sponsored by LifeLites, and by far the most popular (and, as it turned out later during the closing ceremonies, winning) entry was the Star Wars Death Star Disco model. It was filled with all kinds of lights including in the dance floor, and was accompanied by a playlist of disco music. On the dance floor Princes Leia was getting down with Darth Vader while a variety of Star Wars characters were standing around in various poses. Also announced in the closing ceremonies: Next year they’re adding “and Motion” to the “World of Lights” theme. I stayed up way too late that night. I had a lot of technical difficulties with my pictures stemming from the disorganization that came about due to filling up my laptop’s disk. It turns out that a few files from the Ravinia Ballroom were filed under Lake Michigan by mistake, but only on my hard disk (not on Flickr). I noticed there was a discrepancy in the number of photos in the Lake Michigan folder on my computer and the set on Flickr, so I uploaded them to Flickr and filed them under Lake Michigan … only to look at them and realize they were really in Ravinia. So I deleted them from Flickr. And then I realized that I had not uploaded them under Ravinia either, and should have just edited the descriptions instead of deleting them. So next I undertook a full scale audit to verify the location of each image, check where it was on Flickr compared to on my hard drive, and then to upload whatever’s missing. This took many hours, largely because I keep stopping what I’m doing to chat with people, and I stayed up until about 3am to do it. 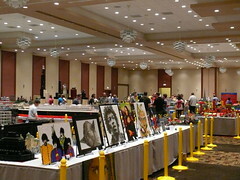 Sunday morning, I went downstairs just in time to take photos of the vendor’s room before it opened up to the public. I brought all the LEGO store bags I had left over, including the extra ones I was given to help pack my things, and gave them to Larry Pienazek and his wife. Larry is a friend and long distance (Michigan) BayLUG member whom I’ve known for as long as I’ve been into LEGO, and they are selling off some of their excess inventory of older LEGO sets. They gave me a small set by way of thanks, which was really nice. 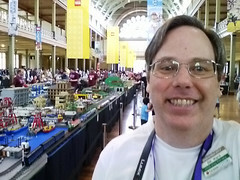 I also sat down with Jim Foulds in the LEGO booth for quite a while and we talked about the LEGO conventions. 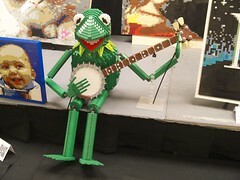 We discussed some of the differences between the various conventions and I asked him for feedback on Bricks by the Bay. 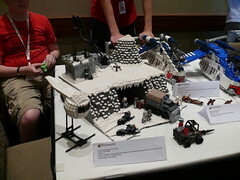 He suggested having more group activities, and we talked at length about how to lay out the vendor room and deal with the crowds of kids who act like ants looking for Brickarms. Afterward I went off in search of a quiet place to work some more on the photo organization and uploading. I went over to the build room, where kids were given a chance to build whatever they wanted out of a huge quantity of dark grey 2×4 bricks. I plugged my laptop in and uploaded the remaining photos that were missing, deleted some duplicates, and rotated ones that were sideways. Partway through the process of fixing sideways pictures, my laptop died due to lack of battery power. Turns out the outlet I was using was dead! Something similar happened Saturday night too, with an outlet in the hallway. I ran into a hotel employee who asked how I was doing and I told him about the dead outlets. Then I went up to the hotel room where I finished the job (but I couldn’t upload photos over the cellular connection I was using) and ate some Fritos and had a quick chat with Valerie on the phone. I was in the vendor room when the public hours ended and teardown began. I talked to several vendors about coming to sell at Bricks by the Bay, and about possible sponsorship opportunities. I also went over to the next room where Vincent Kessels (the guy from Holland who had agreed to go on the boat tour with me the next day) was taking down his things, and talked to him for a bit. But then they locked down the ballrooms and we gathered in the Ravinia room for closing ceremonies. In Ravinia they had taken down all the tables in one corner of the ballroom and set up a video screen and chairs facing it for closing ceremonies. That area had been largely free of tables anyway, as it had some floor-based robotics exhibits (including the giant chess and Robo Rally boards). The winners in several categories of MOC contests were announced, along with instructions for the final door prize giveaways. After that I arranged for a taxi to the train station for our trip into Chicago, leaving the airport at 7am to catch a 7:30 train, and went up to my room. I organized my things a bit, read a bit, and took a little nap, until Mariann came in and started talking about dinner. We went down to the lobby and met up with a group of people, 10 in all, and all agreed to go get dinner. We sent two people to scout ahead to see if we could get a table at the Cooper’s Hawk restaurant next to the hotel. They reported success so we all trooped across the parking lot and sat down. The service was rather slow, but the food was excellent. I had salmon with asparagus and broccoli (special version of their salmon dish meant to be dairy-free). As we were leaving we tried to pay for our meal, only to be told it had been taken care of. Apparently one of the people in our group had quietly settled the bill (and this was not a cheap restaurant, especially with the alcohol some of the people had to drink with their meals!) and disappeared. After dinner I packed up my belongings as much as possible and went to bed. In the morning we checked out of the hotel. We had a bellhop take our bags out of the room and stack them in the taxi (a minivan, thankfully). Vincent met Mariann and me in the lobby and we left a little late, due to some trouble working out how to split the bill and still give Mariann her receipt for tax purposes. Eventually we got to Union Station a bit earlier than planned, and I figured out that we had actually gotten on the penultimate train, which was apparently running about five minutes late! We found the luggage lockers and put our bags away for the day, then headed out to see the city. We took the El train for a couple of stops, just so we could say we did it, and then walked to a Corner Bakery cafe that was across the river from where Vincent said the boat tour left. We left the restaurant with just enough time for a leisurely stroll across the river and down to the dock… only it turned out that he was talking about a different boat tour company, and ours was another three long blocks or so away! I called them to confirm their location as we were walking there, and realized the error. But as we jog/walked to the correct location I realized we weren’t going to make it there by 10, so I called them and told them we were just a block away and they said they would hold it for us. We got there a few minutes after 10, bought our tickets, and went aboard. The boat tour was great. The weather was a little questionable – warm, but with an intermittent light drizzle. We sat under a canopy, but there were open seats in the front row so we could still have a great view. The tour guide explained about the different architects and styles of the various skyscrapers along the river, mixed with history about the city and the river. 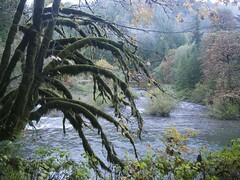 The tour lasted 90 minutes and included excursions up both the north and south forks. All the above sets are also available through the All Brickworld 2011 Photos collection. 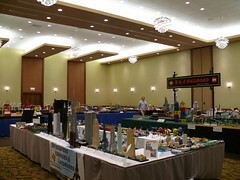 I’ve taken photos of all the LEGO creations on display at Brickworld 2011 in the Lake Michigan Ballroom. This is about 25% of the floor space devoted to MOCs, and that’s not even counting the vendor room. 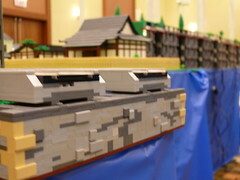 9am: A session led by Ben Ellerman regarding the effort in 2007 by LEGO to bring in members of the adult fan community to provide input for the new castle products then under development. He showed a slide show with a bunch of prototypes from that process, and described his experiences in that project. 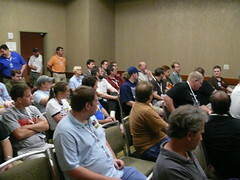 The Q&A session devolved into a discussion about LEGO licensed products, new parts & themes, etc. Also this afternoon I took about 20 minutes to go through all the ballrooms and make a video (using my digital camera) of all the MOCs and vendors. That’s uploading to YouTube as I type this [Update: YouTube rejected it because it is longer than 15 minutes. Sigh. I will have to wait till I get home to edit it]. It’s kind of amazing that even at a pretty fast pace it takes that much time to get around the halls. This hotel has 4 huge ballrooms, and Brickworld is using all of them. Now, all the presentations and workshops are over and I’m taking advantage of the empty room where Christopher Doyle gave his talk to upload things to the Internet and update my blog. Soon I will go around and take photos of all (well I doubt I’ll get all of them, but I’ll do what I can) the models on display. I just uploaded all the photos I took yesterday and today so far, which you can see in the previous entry. Click the image above or click here for a slideshow. 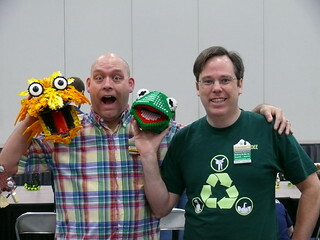 I flew to Chicago yesterday (Wednesday, June 15) for the Brickworld LEGO convention. I used my Frontier air miles to travel from San Francisco to Chicago Midway by way of Denver. It was a long trip – I left SFO at 9am and got to Chicago at 6pm local time – but it was very pleasant and had no problems. I shared a cab from the airport to the hotel with two other guys, who had flown in from Florida. When I arrived at the hotel, I checked in at the front desk and took my stuff up. I changed into jeans and a Bricks by the Bay T-shirt, and went downstairs. I saw the tail end of the opening ceremonies – a presentation about the new LEGOLAND Florida which opens in October. After that I milled about in the lobby for a while. I talked to a couple of people including Arthur Gugick, the guy running Thursday afternoon’s architecture workshop, about doing the architectural boat tour on Monday. He seemed positive about it, and said he would give me some time during that workshop to mention it and gauge interest. I went across the road to get some takeout dinner, and ate it in the room, and went to bed. The top row is not lined up with the bottom row – it is offset by one stud. This helps significantly strengthen the wall, so that if twisted it won’t come apart as easily. For the presentation he used some random bits of LEGO to demonstrate some of the concepts, but it was hard to see from the back of the room. I wished they’d had a video camera (webcam?) connected to the projector so we could all see it. To conclude the session we took time to build hemispheres (domes) out of LEGO bricks. We used “brick paper” to design the circles in both axes out of LEGO parts and then built them out of assorted parts of various colors that were provided. It was a bit chaotic because the parts weren’t sorted or organized, and the assortment of parts provided didn’t match up with our needs very well, but it was still interesting to work on it. The big lesson in making a sphere out of LEGO is to remember that any way you slice up a sphere you get a circle, not just at the 90 degree surfaces but also at all angles throughout the sphere you should see circles all over the surface. He showed a picture of a large LEGO sphere (designed by computer) that they did at LEGOLAND in which you could see circles all over it. The afternoon workshop that I attended was on LEGO architecture, presented by Arthur Gugick with a special guest appearance by Shannon Sproule (aka Shannon Ocean), a great builder from Australia. I video-recorded the entire thing. Arthur began by talking about his experiences building LEGO buildings and how he was chosen to build the Taj Mahal model used in the Australian indie movie “Taj” and how he was flown to Australia where he built an exact copy of the model so the film could have a backup prop. He then introduced Shannon, who was the on-set LEGO guy responsible for the models after Arthur went home. After all this, Arthur showed a short video of a TV commercial he was in for a now-defunct independent LEGO toy store. I had been talking to Arthur about the architectural boat tour, and he let me make an announcement to the group at this point about it. Only one person came forward to sign up, a guy visiting from Holland who is flying home Monday evening. Arthur is interested too but needs to confirm child care before staying an extra half-day. After my announcement, Arthur then brought out the bricks that Shannon had schlepped back from Australia for the prop that was destroyed during the filming (at one point the protagonist destroys it in a fit of frustration/rage). The parts were dumped on the floor and everyone there got to take some. I wandered around for a bit after that, and eventually met someone who was thinking about going to the LEGO store soon, and we did that. I’m afraid I got a little carried away and spent over $700 on LEGO sets at 30% off. Only one of them was for someone else – one of the BayLUG members responded to my call for requests for stuff to bring home. Luckily these people had a large vehicle and we were able to get everything back to the hotel. When I returned to the hotel there was a robotics contest going on. The challenge had been issued in the early afternoon to build a MINDSTORMS robot that could deposit balls in five different containers placed around the field of play. The game was contained in a wooden box – a flat table surface with about 6” high walls all the way around, all made of plywood. The various containers, all made of LEGO, were worth 1, 2, 3, 4, or 5 points each, in varying degrees of difficulty in terms of size and placement. If you got balls in all 5, you would earn 55 points. The amazing thing is you had to build and program a robot in just a few hours to accomplish this task! There were several very clever solutions, and it was fun to watch them attempt (with varying degrees of success) to earn as many points as possible in several rounds of competition. In the end, naturally, Steve Hassenplug won (he always wins these sort of things) but some of the other competitors were quite good too. After that I sort of roamed around for a bit. They had a “ballroom crawl” where soft drinks were provided and everyone roamed around the ballrooms full of displays as a group, socializing and admiring what people brought. After going through all the ballrooms, I went upstairs to write this and go to bed. 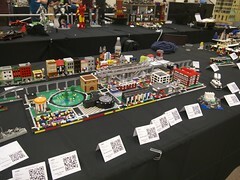 As promised, I made a second episode for LAMLtv about BrickCon. The main feature is an interview with Joe Meno, editor of BrickJournal. If you have any thoughts about LEGO video projects, you can share them with me here or over on the LAMLradio blog.